At this time, 658 people have been killed in L.A. County over the past 12 months alone. And that number is only growing. When homicide stories are staples of the 24 hour news cycle, and even more left out from news coverage, reactions to violence are increasingly numbed; it’s difficult to feel for another point of data when there were many that came before. How do you tell the story of hundreds of deaths from the past 18 months in Los Angeles? How do you represent them in a way that puts their lives at the forefront of public consciousness? 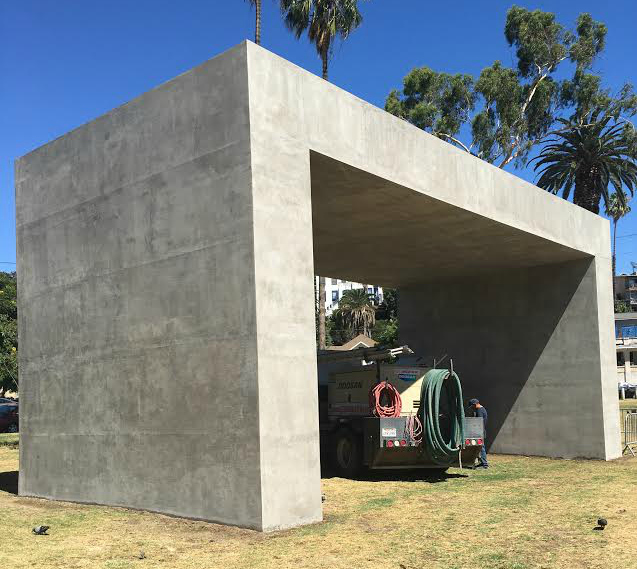 When Mexican artist Teresa Margolles was invited to be a part of the Current: LA public art biennial, centered around the theme of water, she decided not to work with the water from Echo Park Lake, an oasis in the concrete jungle that is Los Angeles. “I was interested in the people, the streets, and what’s happened on the street. What I saw on the streets were the murders, the assassinations, the violence,” Margolles said in Spanish. She drew a spiral centered around the park, pinpointing locations such as Hollywood, Chinatown and Huntington Park. Then, she selected 100 out of over 900 victims, mainly comprised of Hispanics and African Americans, that were lost in areas along or near the spiral, making sure to represent every area within the limits of Los Angeles. With the destination set, Margolles recruited the help of 20 other artists to clean the sites of deaths with buckets of water and sponges. She was usually approached by the friendly members of the neighborhood that had suffered together, whether it was a simple smile or a pat in the back. Other times, people would approach her warily. As she scrubbed at the sites of homicides, she always felt one thing in particular, a word that could only be expressed in her native tongue – coraje, a feeling of helplessness, anger and sadness. She said, “Why the hell do things like this happen?” Her voice, wavering and tinged with frustration. The water from the cleansing, wrung from the sponges, is bottled up and labeled with the names and ages of the victims and the dates and locations of their deaths. Knowing that the unsettling nature of the water bottles would drive people away, she decided not to leave them out for people to see. Instead, Margolles decided to build a simple rectangular structure with the water used as part of the mixture to construct the structure. She gave a cold, lifeless hunk of concrete a breath of humanity, yet the structure wasn’t the art piece. The piece, she said, was la sombra, or the shade, casted by the concrete structure. It represents the memory of the victims and the trauma the community faced together in the homicides’ aftermath. The symbolism is not tangible as it is palpable, providing a moment of reprieve and reflection on a hot summer’s day in the city of angels. “Once you step foot in ‘La Sombra’, you’re going to know what it is about,” Margolles said.